It is especially important to maintain data security vigilance now that the European Union (EU) is set to enforce the General Data Protection Regulation (GDPR), a regulation that aims to protect all EU citizens from privacy and data breaches, in May 2018. GDPR will not solely apply to organizations located in the EU; GDPR must be observed by all organizations that process or store personal data of data subjects living in the EU. Importantly, GDPR affects controllers and processors of data, which include “clouds.” Failure to comply with GDPR will result in heavy fines. Now that legislation is catching up with larger penalties at stake, it is even more important than ever to create a data security culture within your organization. The security of mobile learning data is greatly dependent on the security of the mobile device on which it is accessed, meaning that users need to be trained in how to keep information safe. In this article, PulseLearning shares six tips for maintaining data security on mobile devices. If your phone or tablet is lost or stolen, a tracking app can help you locate it; simply find a computer, log in, and begin tracking. Some options include Avast Anti-Theft, Cerberus, and Prey. Remember to also set up any phone-locating software that comes with your devices, such as Find My iPhone, Android Device Manager, and Samsung’s Find My Mobile. These days, cybercriminals are sophisticated, so if you do not have anti-malware software installed, your information is unprotected. To avoid mobile device threats, install authorized anti-malware software and check for updates on a routine basis. Avoid dubious websites or chat rooms. You usually know when you find one. Always avoid accessing suspect download websites or chat rooms because they can spread viruses that harm or degrade the performance of your mobile device and learning content. Make sure your Internet connection to your mobile device is safe and secure. An unsecured Wi-Fi connection can make your personal information subject to cyber attacks. Ensure your connection is password protected using a password that is not easy to guess. You can prevent unauthorized access to your mobile learning content using user IDs and passwords. Better yet, if your mobile device provides biometric access, such as fingerprint touch ID, use this instead because login credentials can easily be compromised. If your organization allows mobile learning or BYOD to be accessed on provided mobile devices, thorough training in data security and safety best practice must be offered. Many people overlook simple security compromises such as accessing confidential information while on a public transport commute home where others can easily gain visibility. PulseLearning takes data protection seriously. By collaborating with us for your online or blended corporate training needs, you can have peace of mind that we understand and can support your organization in preparing for the implementation of GDPR. 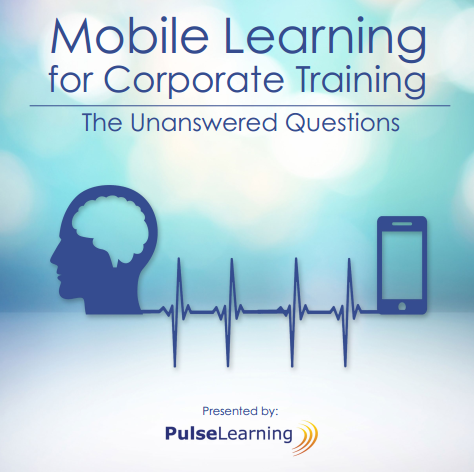 PulseLearning is an expert in Mobile Learning strategy and can help your organization stay current with learning trends while maintaining data security. We understand the importance of undertaking due diligence now to ensure you are protected later.